“And the livin’ is easy”. It’s fairly certain that the Gershwin Brothers didn’t have this snoozing snapper in mind when they wrote that song. On the other hand, the grand lady seems to be enjoying a lazy day from her perch along the banks of the Muskegon River. So who knows? For MRWA board and staff, the season is anything but lazy. Not surprisingly, this is always our busiest season with the bulk of the major project work in full swing. We are planting trees and replacing road stream crossings to satisfy our major grants – a lot of work to manage and coordinate. In addition, there are any number of ongoing programs that require attention along with unscheduled opportunities that always seem to pop up. Of particular interest in category one is the rejuvenation of a vital activity that our organization has supported for more than a decade and which aligns perfectly with our mission. The stream monitoring program, managed by the Michigan Clean Water Corporation (MiCorps) funded by the Department of Environmental Quality (DEQ) has always made a lot of sense to us. Trained volunteers, also known as Citizen Scientists, collect and analyze valuable data about the health of our freshwater resources including the streams within the Muskegon River Watershed. Environmental agencies refer to the information to help determine action plans. Everybody wins. Sometimes a long-standing program like this one, despite the importance, can go a little stale through complacency and lack of energy. It often takes a dedicated individual to breathe new life into it. In the MRWA offices, that individual would be Patricia (we call her Pat) Jarrett who brings energy and determination to everything she does. Her article leads the summer Riverview and provides an up close and personal perspective of a favored program along with a small but high impact project that she pulled off. Summer is also a time when the MRWA education committee under the leadership of Nancy Burmeister steps up their game. Read Nancy’s report to learn about the educational events focused on area youngsters. She believes that delivering the lessons of environmental stewardship to a young audience will pay dividends in their life-long commitment to protect the natural world. This month we are fortunate to welcome two new contributors to the Riverview. Jenna Johnson started working as the Outreach Coordinator for North Country Cooperative Invasive Species Management Area (NCCISMA) in April of 2018. She is a highly qualified expert and local resource on invasive species of all descriptions. 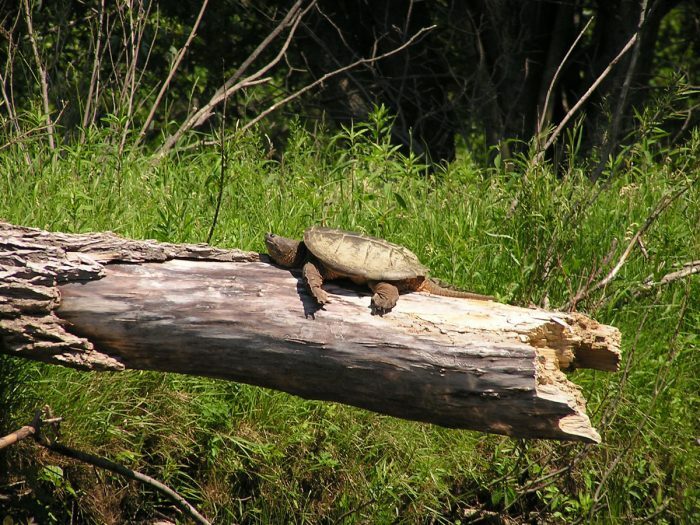 Her article focuses on a new threat to Michigan’s hardwood forests. We hope to include her in our group of regular contributors. Lynn Scheible is the Executive Director for Artworks in Big Rapids. Lynn and her team have big plans for the fall including an exhibit sponsored by the Smithsonian Institute. She has agreed to share a preview of the events planned for Big Rapids.